It is also ideal for casting hands and feet or other small projects. It mixes up bright pink and fades to white after 2 minutes. This tells you that you have 1 minute before the alginate sets. 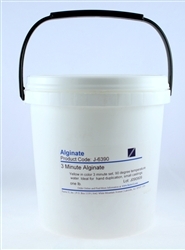 This is a recently updated version of one of our original alginate formulas. Designed for hand casting projects, impressions of limbs, fingers, orthotics and prosthetic's. Sets fast in warm water (3 minutes when using 90°F water).